Cok WhatsApp Recovery helps to export and recover WhatsApp messages on computer, which could export WhatsApp messages from all mobile (including iPhone and Android phones) to your PC. 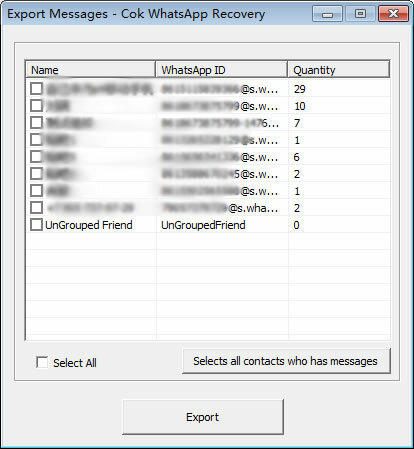 You just need to export the folder of WhatsApp Messages to computer and open this software to view (You can find some deleted WhatsApp messages on our software interface). As for the method to export the folder of WhatsApp Messages to computer, please click the link on the bottom of this website. 1. To export WhatsApp Messages in the phone to computer. You could click the interlinkage below to know more about steps in detail. 2. 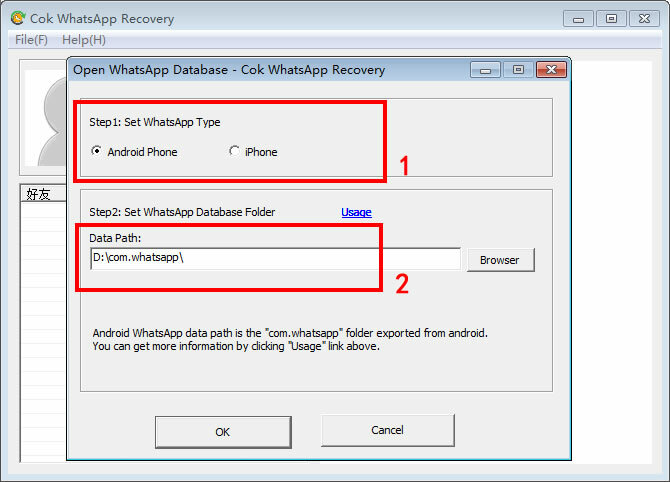 Open “Cok WhatsApp Recovery”, choose WhatsApp type, set up data path (and resource path), and then click OK button. 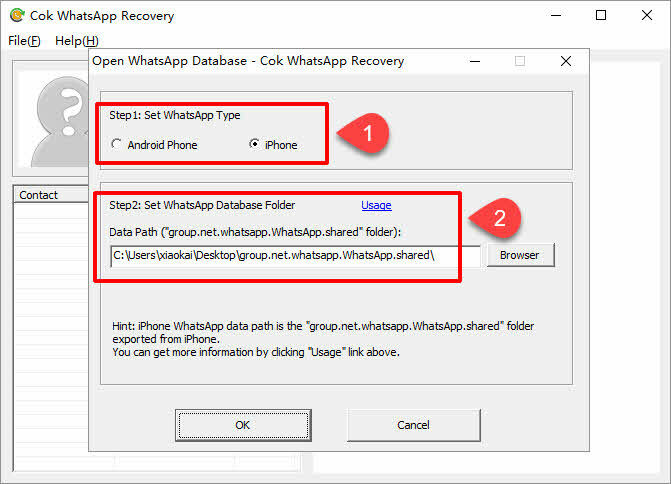 iPhone: Set data path as the exported "group.net.whatsapp.WhatsApp.shared", and set resource path as the exported "net.whatsapp.WhatsApp" folder. Android phone: Set data path as the exported "com.whatsapp" folder. 3. Now all the messages(including some deleted messages) are shown on the software. 4. You could also export WhatsApp messages as html file with Cok WhatsApp Recovery, Please click“File(F)” -> “Export(E)” menu, and then choose the WhatsApp friends ID that you want to export.